One of Alise Post brothers found out about BMX when she was just 6 years old, and when she started riding she noticed other little girls out at the track and decided she should try it too. Backed out of racing at the last minute. She looked down the steep starting hill and couldn’t bring herself to do it. After overcoming her sense of nerves the next week she placed 2nd in her second attempt at racing. She turned Professional during the third week of January 2006 at 15 years of age. Despite being one of the best female BMX racers in the U.S. back in 2008, Alise Post was denied a spot on the Olympic team because, at age 17, she was too young. The age minimum for an Olympic BMX racer in 2008 was 19. In a sport that awards national titles to champions as young as five, a racer’s rise to fame comes early, and the young BMX star from St. Cloud, Minn., who was accustomed to racing at the sport’s top level, was forced to witness BMX’s pinnacle event from afar. To distract herself from the disappointment, Alise spread herself thin across three sports: BMX, gymnastics, and track and field, while maintaining a 4.0 grade average. The Herculean efforts demanded by her activities took a toll and her 2008-09 BMX racing seasons suffered as a result. Throughout those years, Alise had a bit of a reality check. Injury and fresh competition brought new challenges to her. Despite her below-par performances on the international level, by the end of 2009 she was back among the world’s best. 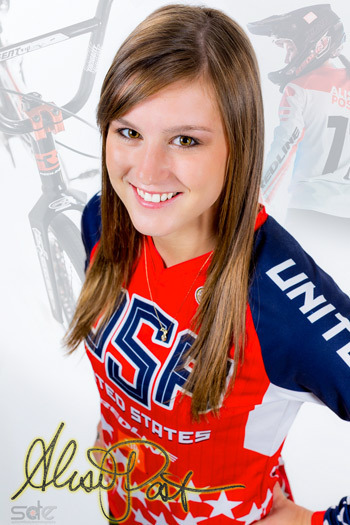 Once she became eligible for the 2012 Olympic Games, Alise took her dedication to BMX to a new level. Upon graduating high school in 2009, Alise retired from gymnastics and track and field in order to relocate — at the invitation of USA Cycling — to the Olympic Training Center in Chula Vista, Calif., and regain her winning ways. Although she remained busy by continuing her education as a fulltime student at the University of San Diego for the 2009-10 academic year and by increasing her involvement on the BMX World Cup circuit, she saw big improvements in the beginning of 2010. As a result, she resolved to narrow her focus yet again by making the difficult decision to take a break from college and completely dedicate herself to BMX. Within months of this decision, Alise claimed a place as the top-ranked American, both nationally and internationally, by taking third place at both her first elite world championship, and at a world cup race on her home track in Chula Vista. She followed up those results with a fourth place at the final world cup round in France and by finishing second overall in the world rankings. A true competitor, the 5’2″, 120 lb. Post began immediate rehab following surgery and was back on her bike in time to successfully defend her USA Cycling national championship title in the spring of 2012 and hasn’t slowed since. She was voted 2006 Rookie Pro of the Year by the readers of BMXer magazine, the ABA’s official publication. She is the first female to win the title. At 15 years of age, she is the youngest female to hold the National No.1 Pro Women’s title. She is also one of the youngest to turn pro female or male in BMX since the early days of the professional class of the late 1970s. She is also one of the youngest to hold a pro title since that era. She is also the first female to earn all three Girls division classifications that have existed: No.1 Girl Amateur, No.1 Girl Amateur Cruiser and No.1 Girl Pro.She became ABA No.1 Pro Girl in her rookie year. 2015 USA Cycling BMX National Champion, Elite women’s supercross, at the Novant Health BMX Supercross Track in Rock Hill, SC. Alise Post is winner of 2nd place, elite women’s superfinal time trial at 2013 UCI BMX World Championships. She is 2011, 2012, 2013 and 2014 USA Cycling BMX National Champion, Elite women’s supercross. She is in conversation with Namita Nayyar President Women Fitness.